How did you learn fly fishing? I started out as a bait angler, but eventually the excitement wore off and I was looking for my next challenge. I had seen people fly casting at a river near my home, and it just looked so romantic. I was interested in learning how to do it, but the assumption that it was difficult had me stalling and putting off the process. 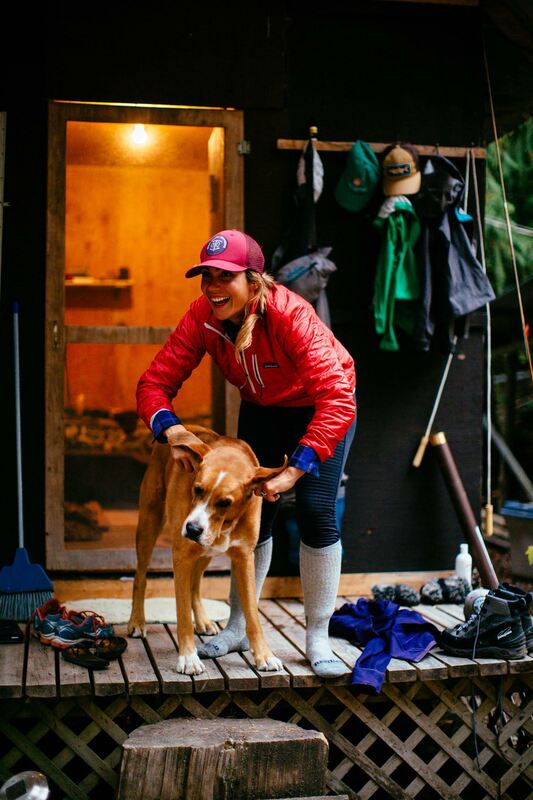 Upon trying it, I couldn’t get enough… but I knew that the only way to be able to be out on the water every day was to make a living in the same field. Before you can just dive into a career, you need to know your craft, so I had to invest some serious time on the water. In the beginning, I was working for another outfitter, but after a few years I started Fly Gal and the rest is history. Were my parents concerned? Sure. But we can look back now at all the stresses and smile that perseverance goes a long way. Did you have someone to teach you in the beginning? I had a fishing buddy, Dave Puffer, when I was 16 or 17 years old. He wasn’t really a fly fisherman himself, but when he and the guys saw my interest in fly fishing grow, they gifted me an old 8 weight Shakespeare fly rod and some fly fishing VHS tapes. The fly rod had no reel or line, so I went to a fishing trade show that had different vendors there. Nobody would give me a straight answer about a good line for a beginner, “do you want a double taper, bass bug taper, intermediate line, full sink, weight forward…?” I was lost, and the salesmen just enjoyed listening to themselves talk. There was just so much ego involved… that only furthered my ambition to understand the sport. I wanted to become a fly fishing teacher to help avoid confusion. I don’t think it’s necessary for people to be confused, and therefore discouraged, when learning how to fly fish. Once I finally got my equipment sorted, from there I learned mostly on my own. I watched tapes and watched experienced fishermen out on the river. I would sit on the river bank or fish behind them and try to copy what they were doing. Was there anything especially difficult about learning to fly fish? Catching a fish was not an overly difficult task for me in the beginning. I was born in British Columbia, so I grew up fishing for salmon, trout and steelhead in the river. There isn’t the same sort of line management or studying the hatch like there is with trout fishing in other parts of the world. Often times, even when the line lands in a pile on the water, the current just straightens the leader out for you. The casting, however, was the thing I wanted to excel at. I think that’s a major part of the appeal to many people who are looking to start out. As I picked up casting fairly quickly, I was confused by the people telling me that it was so hard. I assumed I must be doing something wrong (for example, that the double haul was impossible). So I kept waiting for it to get hard. It sounds silly, but that created a lot of confusion for me. Pantomime practice helped me learn to cast more rapidly than if I’d waited to be out on the water to practice. I would sit on the edge of my bed watching a video, following along with the instructor until the rhythm of my hands were moving in sync. So when I got to the river, casting felt more natural than it otherwise may have. One thing I wish I had done in the beginning, however, was read about casting, and also to take a proper lesson (which I did end up eventually doing). Studying to get my Masters through the FFF (which I am currently working on now) has been one of the best things I have ever done, as it forces me to truly understand the physics of the cast. While I’m on the subject of beginner anglers, something that was an eye opener for me in the beginning was that the false cast only exists to deliver the fly to the fish — it serves zero purpose in the air (I’d thought that the fish could see the fly’s shadow and therefore that was what fly-fishing was). It sounds silly now, but such things are not always obvious for a beginner who hasn’t seen fly-fishing in the river before. When I guide, I explain that, 99% of the time, it doesn’t matter how ugly your cast is, as long as the fly lands in the water. 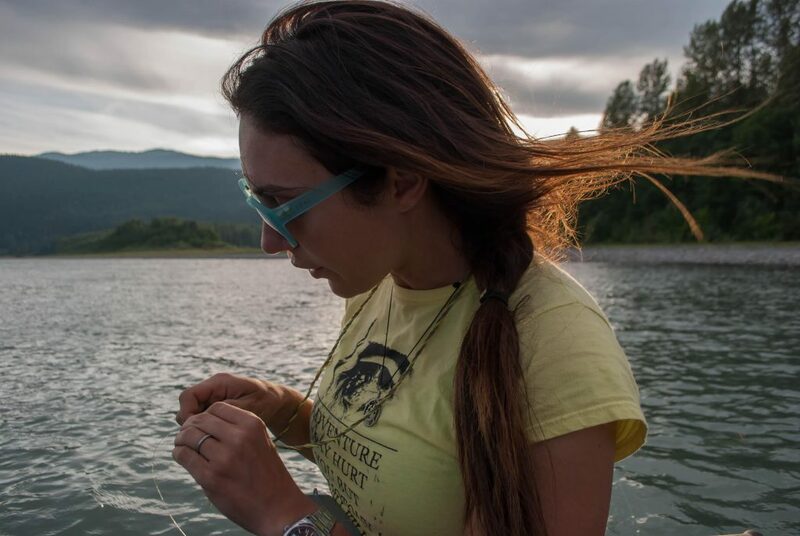 It makes no difference for the fish if you are picking your nose while the line is in the air — remember that it doesn’t have to be a pretty cast, to catch a pretty fish. Understanding the river’s flow is necessary, yet not something that a lot of people take time to do. I think you can learn a lot by watching the river before even thinking about casting. What’s your favorite place for fishing? The one that catches fish. I don’t believe in specific fly patterns (for steelhead or salmon). More so than a particular fly pattern, I believe in profile, presentation, and confidence. What is your top fly fishing memory? My most memorable fly fishing memory was my first ever steelhead on a fly. It was in Chilliwack (in British Columbia). I was fishing behind a bunch of bait fishing guys, thinking I had no chance. I ended up landing a 15 pound steel head on a fly that I had tied myself. I was alone and I just felt so strong and proud. It’s such a simple memory now, but it gave me the confidence I needed to keep up my pursuit. Do you have a fly fishing related dream or goal? On a professional level I would like to complete my Masters in casting. 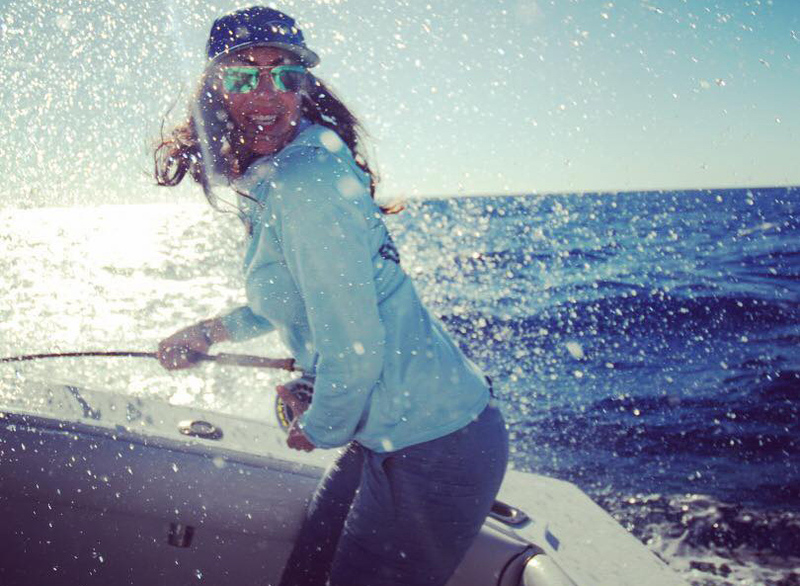 From a personal stance, I’d like to land a marlin on the fly (out of gear, of course). Many people dream of a job related to fly fishing. 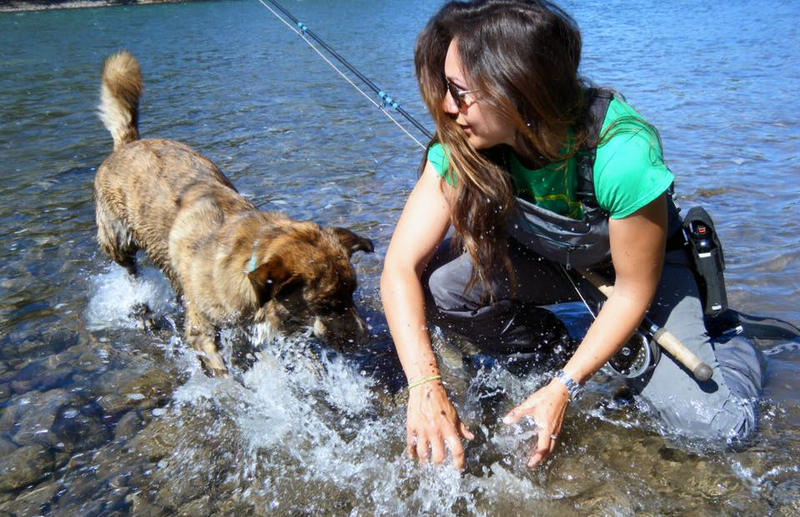 How is it for you to be able to live and work with fly fishing? I’d be lying if I said that working in the industry hasn’t changed things for me. Sometimes I miss the days when I could just go fishing and relax — you know, the days when it was just about fishing. Now I have to worry about if someone sees me making a bad cast, if I’m with a film crew pressuring me to catch a fish, I have to worry about people with iPhones putting my bad days up online, when I’m with clients, I need to make sure they’re safe. I’m really grateful for where I am in my career and I wouldn’t change a thing, but there is so much pressure now that, at times, I do miss the old days. Such is the price, right? If you are not catching fish — leave your fly in the water longer (aka slow down). As a beginner, never feel intimidated when walking into a fly shop. If you do, find another fly shop. Stop changing flies — more often than not, it’s about presentation and how the materials looks in the water. 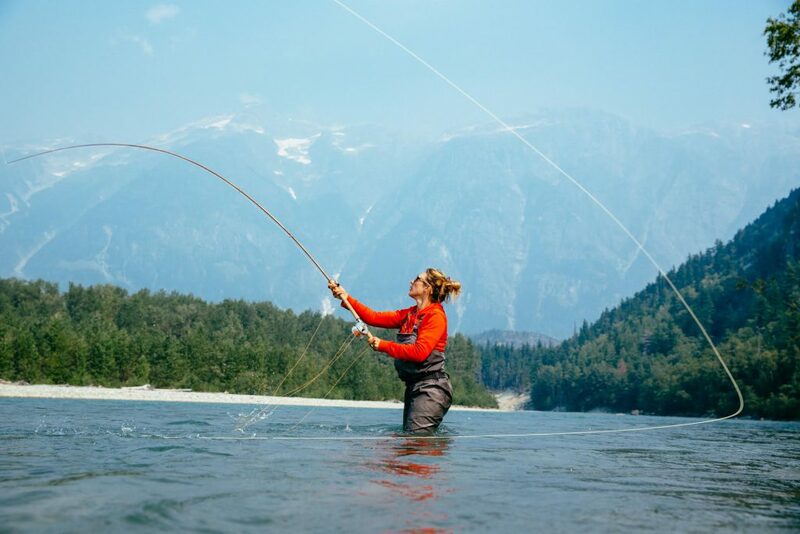 In this article series you get to know and learn from fly fishing enthusiasts around the world. Find out how they got started with fly fishing. And what makes them so enthusiastic about fly-fishing. 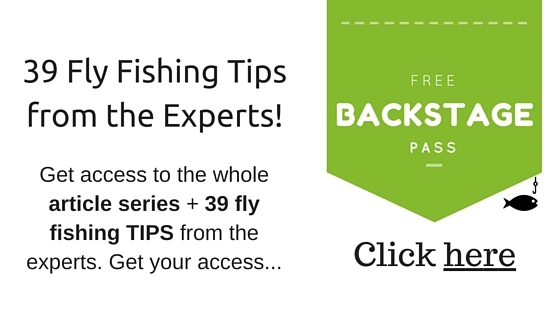 With a backstage pass you get access to the whole article series plus a whole lot of awesome tips from these pros. “Slow down” is excellent advice — and not just for fishing. As usual very good advice from a well qualified lady! Gifted with her talent.